GALION — After finishing their 2017 campaign below .500 (10-14 overall), the Northmor Lady Golden Knights softball team, once again led by Russ Montgomery, will lace up to compete in the inaugural spring sports season in the Knox-Morrow Athletic Conference. A season ago, Northmor finished in fifth in the now defunct Mid-Ohio Athletic Conference Blue Division with a 6-8 record within a tough conference that was dominated by the Cardington Lady Pirates. 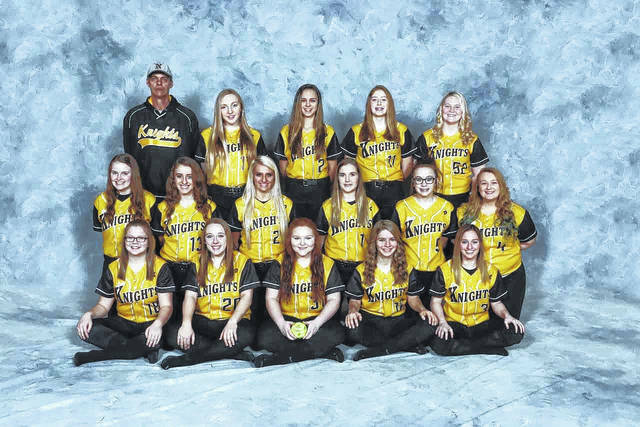 The Knights will look to attain that level with three seniors, three juniors, one sophomore and potentially eight freshmen seeing some varsity playing time, including pitchers Megan Adkins and Maddie Hoverland. Senior Alison Ivy will also take on pitching responsibilities for Northmor. Cristianna ‘Tiny’ Boggs will be back for her fourth varsity season after earning first-team all-conference and Division III all-Ohio honors last season. Boggs brings a tremendous amount of offense and speed on the bases as the team’s leadoff hitter and primary centerfielder. Junior and now three-year starter Lily Tate, second-team all-conference last year, will also have to help Boggs and the rest of the Lady Knights pick up the pitching, catching and all-around ball playing that the Lady Knights lost with the graduation of Shelbey Lilly, Lydia Farley, Lindsey Wiseman and Andrea Weis. The weather has prevented the season from starting for the Golden Knights.